UPDATE April 2, 2019: The Tidal Basin cherry blooms reached "peak bloom" on April 1. The peak-bloom period usually lasts 5-7 days, but cold weather during April 1-2 may extend the blooming period into the convention weekend of April 6-7. Nevertheless, out-of-town Sacred Harpers with their hearts set on in seeing the cherry blossoms in full bloom (and without weekend crowds) are advised to visit the Tidal Basin on April 4 or 5 -- before the convention rather than during or after the convention weekend. Also, one should not fixate on the Tidal Basin cherry blossoms alone, as there are various kinds of cherry trees, other flowering trees, daffodils, forsythias, etc. in bloom all around Washington. The blooming of the famous and beautiful -- but transitory -- Yoshino cherry trees around the Tidal Basin and Jefferson Memorial in Washington, DC usually reaches a peak during the first week of April, although there is considerable variation from year to year. Singers attending the Potomac River Convention during its usual first-Sunday weekend in April usually are able to see the blossoms in at least partial bloom, and in some years are able to catch them in full bloom. Starting in late February or March, the National Park Service horticulturist in charge of the trees issues predicted peak-bloom periods (see Web links below). The definition of "peak bloom prediction dates" seems to be imprecisely explained and may be misinterpreted by the news media. 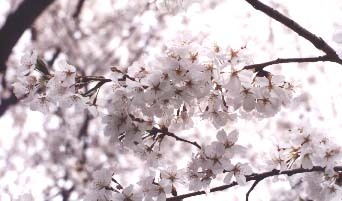 (The term sometimes means the range of dates in which the Peak Bloom Date (first day of at least 70% open blossoms) is expected to fall. Some media may misinterpret this range of dates to mean the precise dates in which the blossoms will be at their peak.) It is best to visit the cherry blossoms very early in the morning or late in the afternoon or early evening, to avoid the crowds. Other species of cherry trees, as well as flowers such as daffodils and some tulips, are usually in bloom during this period also, providing multiple delights to those visiting Washington for the Potomac River Convention. Kwanzan cherry trees around the Tidal Basin, Hains Point, and East Potomac Park, usually bloom around two weeks after the Yoshino cherry trees. For latest information on blooming dates, consult the Bloom Watch Web page of the National Park Service. The 2019 National Cherry Blossom Festival will take place from March 20 to April 14. Consult the Festival's Web site.